To ensure a better game experience, we are performing an update from Mar. 27th 2:00 to Mar. 27th 6:00 EST. During this time you will not be able to log in. The duration time is an estimate and may be extended due to technical issues. We really appreciate your patience and understanding. 1. Divine Descent: Eye of Orochi! g Jade, Mystery Amulets or AR Amulets will have a chance to summon SSR Shikigami Orochi! The following summon events will also be held at the same time, so don't miss out on this great chance! * The summon events are available to players level 15 or above. - All SP/SSR Shikigami chance up! 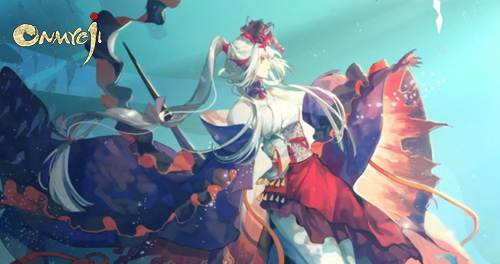 During the event, the summon chance of SP and SSR Shikigami will be 2.5 times the normal chance! Note: After the player has summoned an SP or SSR Shikigami for 3 times, the summon chance will revert back to normal. For players who complete the SSR collection before the update on March 27th, the appearance rate for SSR Orochi is increased to 20% when an SP or SSR Shikigami is summoned. After a player has summoned the first SSR Orochi during the event, the appearance rate will revert back to normal. Note: Only Shikigami that are lit in the SSR Shikigami Collection will be counted (Ryomen excluded). SSR Collection does not include crossover characters Medicine Seller, Hozuki, Inuyasha, Sesshomaru, and Kikyo. During the event, players who do not obtain an SP or SSR Shikigami after performing 10 consecutive summons with Mystery Amulets, Jade, or AR amulets will receive 1 Mystery Amulet. - All R Summon x10 Rewards! Players who perform 10x summon and receive all R Shikigami for the first time during the event will receive a mystery reward. Note: This only applies to 10x summon. Single pulls do not count. Players can obtain scroll shards by participating in different activities in the game. Donate scroll shards to help repair the memory scrolls. Players will obtain a random reward for every donation. After a memory scroll has been fully repaired, rewards will be awarded to all players according to their donation ranking. - In order to enrich the storyline and provide players with a better experience, the Memory Scrolls content is under revision and the video is not currently available. - While the Memory Scrolls event will start after the patch update on March 27th, the story won't be unlocked until we complete the revision. - The reward of the Memory Scrolls will not be affected due to the revision, you can still get the rewards. We regret any inconvenience caused to players & thank you for your understanding and patience! 3. Get ready for new BOSS Shinkirou! After the update on March 27th, new Assembly Boss Shinkirou will appear in Demon Encounter! Players can challenge the new boss Shinkirou on Monday and Tuesday every week. The weekly challenge for Assembly Boss Odokuro and Namazu will be adjusted to Wednesday and Thursday respectively. 4. Friendship Pack x Ame Onna Limited Skin event! Participate in the Friendship Pack x Ame Onna Limited Skin event to obtain Ame Onna's new skin "Lady in the Snow"!Players who redeem this skin during the event period will obtain a "Vitality" frame as a bonus! 5. The Descent of Froglets! Beware as the froglet army strikes on April Fools Day! During April Fools Day, players who clear Exploration Zone will have a chance to encounter Froglets Descent Demon Seal. Participate in this event for a chance to obtain the April Fools Day exclusive Kamaitachi frame! If you miss the event, you'll still have the chance to obtain the April Fools Day exclusive Kamaitachi frame by purchasing the Kamaitachi Pack in Store until April 2nd 23:59 EST. Note: if you have already owned the Kamaitachi frame, it will be automatically converted as 401 coins when you obtain it again. 6. New Skins on Sale! Shouzu's new skin “Ocean Beauty” and Hakuro's new skin “Sakura Archer” will be available for purchase in the Skin Store after the update on Mar. 27th. They will be 20% off for the first week, so don’t miss out! The display and the interface of Shikigami Bios improved! And we released new bios for part of Shikigami including Ootengu, Yoto Hime, Enma, Higanbana and Menreiki. After unlock the new bios, you will get the new accessories and skill-casting effects. Unlocking the new bios needs a certain Shikigami affection. Sending gifts can add Shikigami affection. Those gifts can be obtained from Kimodameshi, Feat Shop for the guild, Demon Encounter, Friendship Packs, purchasing Special Gift pack in the store and so on. The price of the Special Gift pack will be 50% off for the first 2 weeks. Note: Currently it's not possible to unlock bios by winning practice battles even some unlocking hints said that. The practice battle mode now is not available. 8. New loading pictures added! After the update on Mar. 27th, we update the default loading pictures and added more in the store. Let's come to have a check! The Evil God Orochi is preparing to descend upon Heian-Kyo! Please enjoy the new opening CG of the evil god Orochi! 1. Speeded up the skill-casting speed of Kikyo's Soul Barrier skill. 2. Optimized Momiji's model before her evolution, making the new model more consistent with the concept of art. 3. Players can now easily check if their Shikigami are equipped with Souls at the start of an Ultimate Orochi zone challenge. 4. A slide bar is added when selecting Shikigami at the start of an Ultimate Orochi zone challenge. 5. Hungry and unhappy status displayed above the pet in your courtyard have been removed. You can still check their status in your Pet House. 6. Optimized the display of the Shikigami page when the player has no Shikigami. 7. Optimized the skill-casting AI ofKoroka's Silence Prank skill. Under auto mode, the skill will now be cast on a random enemy with Prank status. 8. Optimized the rules for making wishes: If you have collected a Shikigami before, you can make a wish for the shard of the Shikigami even if you currently don't have a shard or a pact of the Shikigami. 1. Fixed the issue of lack of highlight in the left eye of Kusa's model. 2. In-battle Carp Banner that counts as taking a turn will no longer trigger skill effects likeJuzu's Karma (which gains her a Bead when an enemy takes an action). 3. Corrected the skill description of Shiro's Soul Call skill. The Protection of Shiro should be "Sustainable for 1 turn" rather than “Lasting for 1 turn". 4. Clarified the skill description of Hiyoribou's Nourishment skill. Added the line of "If multiple Hiyoribou are present, all of their Sunshine Dolls will be sacrificed." to clarify the co-related effect. 5. Fixed the issue of when a Shikigami is granted a new turn by a skill effect, a Move Bar lowering effect would cause the Shikigami to lose the chance to take actions. 6. Revised the skill description of Hako Shoujo's Retrace skill with the line "Effective immediately when a preserved ally would be KO\'d from taking damage, preventing the ally from taking lethal damage." to clarify its effect. 7. Fixed the effects regarding revival skills. Under some circumstances, the debuffs on the revived Shikigami are not removed. 8. Fixed the incorrect interaction between the Souls Senecio and Yamabiko regarding incorrectly inflicting Daze. 9. Fixed the issue of a counter-attack launched by the Onmyoji's Totem, which will gain Juzu a Bead for her skill Karma. 10. Fixed the inconsistency error in the models of Inuyasha before and after his evolution. 11. Fixed the display error of some of the in-battle effects of Sesshomaru's Demonic Aura skin. 12. Fixed the display error of Menreiki's Red Asura Masks accessory on some devices. 13. Fixed the incorrect in-battle voices of Menreiki when she's in her evolved skin.